The Nissan Murano has received an upgrade pertaining to its interior features. You'll feel as though you're driving in luxury even though you're in an SUV while on the roads in Westborough. Several features offer assistance while you're driving including emergency braking, and a rear cross traffic alert system. Instead of using a key, start your vehicle using the sound of your voice. The touchscreen navigation offers impeccable directions when you're on the road, or you can sync your smartphone to view directions and information that you have stored. Android Auto and Apple CarPlay allow you to view the apps on your phone and make hands-free phone calls. Herb Chambers Nissan of Westborough can help with setting up the system. 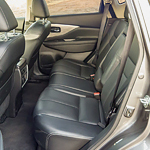 The interior of the vehicle is comfortable and spacious. All you have to do is touch a button for the automatic climate control system that can keep everyone cool or warm depending on the time of year. A memory system on the driver's seat maintains your favorite position each time you get behind the wheel.